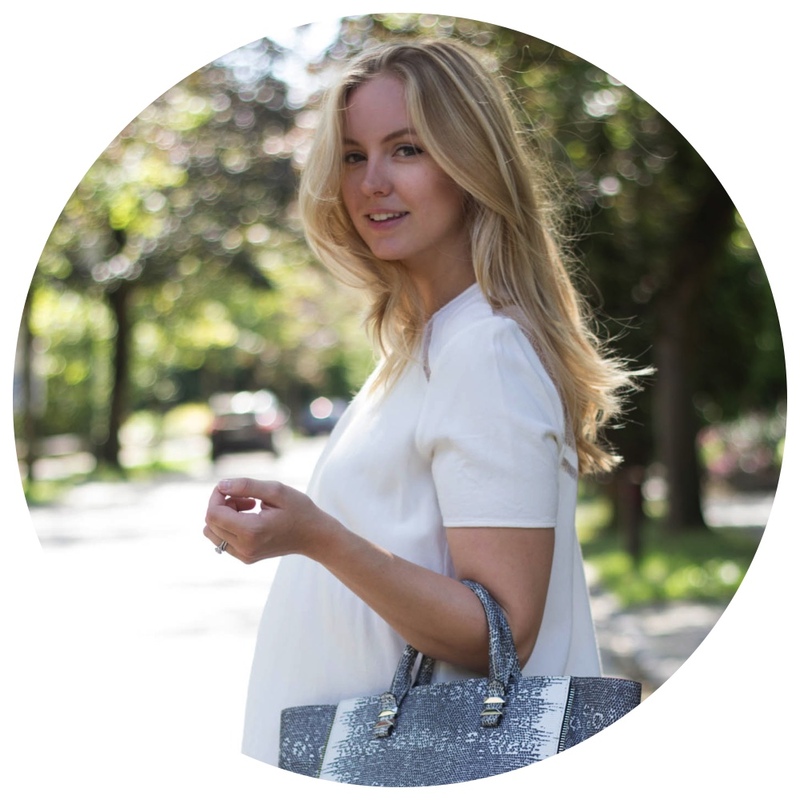 Today, I wanted to reveal my best-kept beauty secret for a gorgeous smile with you. My journey starts quite a long time ago. Growing up, I already had some issues with my teeth. As a kid, I would often go to the dentist multiple times a year to do a checkup that would nearly always end up with me returning for further appointments as I always had new cavities. Fast forward a few years, when I decided to really take my dental hygiene up a notch. I switched dentists as I wasn’t comfortable with mine and decided to start wearing clear braces to align my teeth. This meant that I had to brush my teeth multiple times a day and move on to a more thorough routine that involved flossing and using a mouthwash on a daily basis. This made me realize how important it is to take care of your teeth every day to prevent long-term, painful damage. 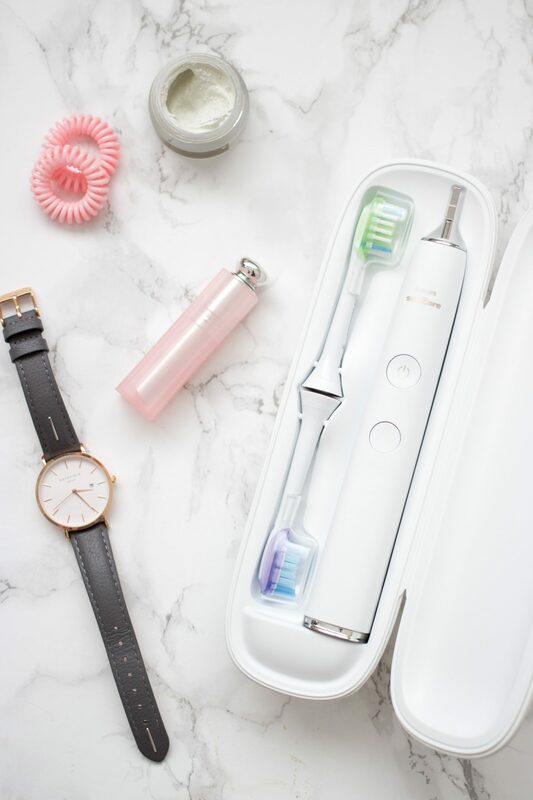 So when I got the chance to try out the new Philips Sonicare diamond clean smart toothbrush, I couldn’t resist it! 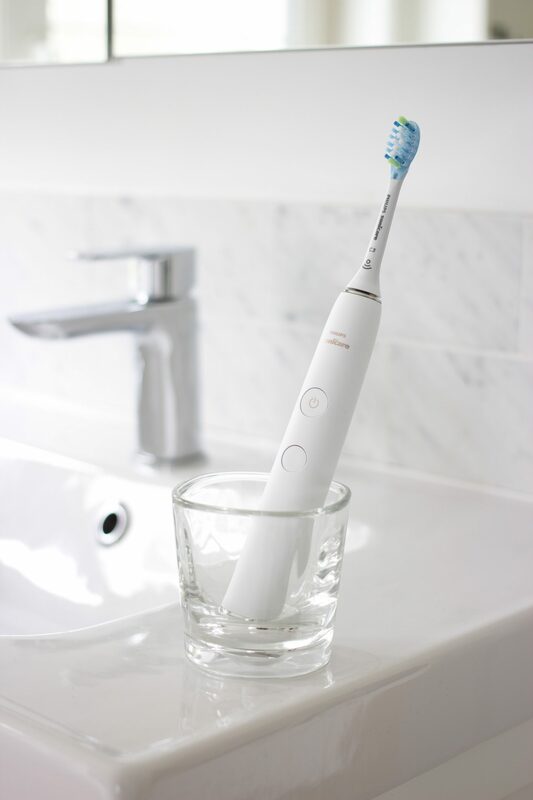 This Philips Sonicare toothbrush is like having a personal assistant just for your teeth. 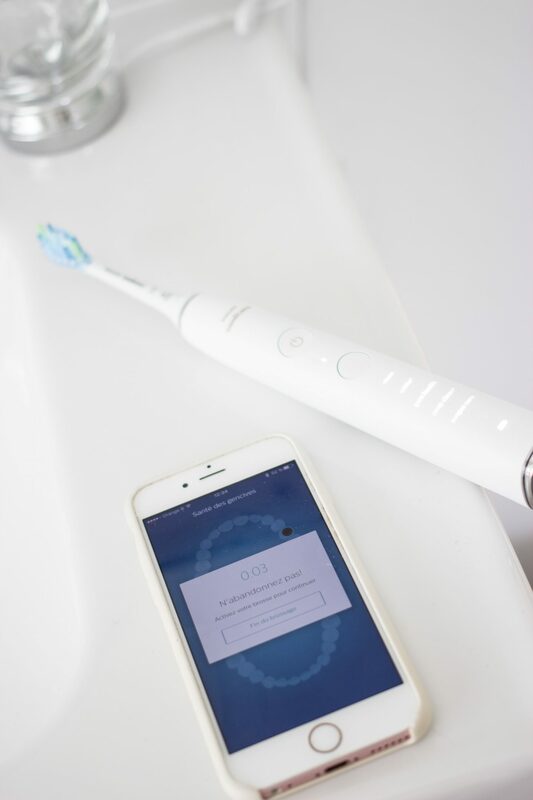 The patented technology Sonicare, which allows up to 62,000 movements per minute, combined with a large, rectangular brush head allows you to efficiently clean your teeth while the app allows you to stay on track and even share information with your dentist. I started my journey with this new electric toothbrush by downloading the (free) Sonicare app on my phone. After registering, I was able to enter my details and even set a specific goal (I chose the healthy gum goal) as well as register certain teeth or zones with specific concerns. While some might think that a connected toothbrush is a bit over the top, it has changed things for me. Not only do I get reminders when it’s time to change my brush head (approximatively every 3 months), I also get alerted when I use too much pressure or get a gentle reminder when I’ve neglected a specific area that needs a bit of attention. 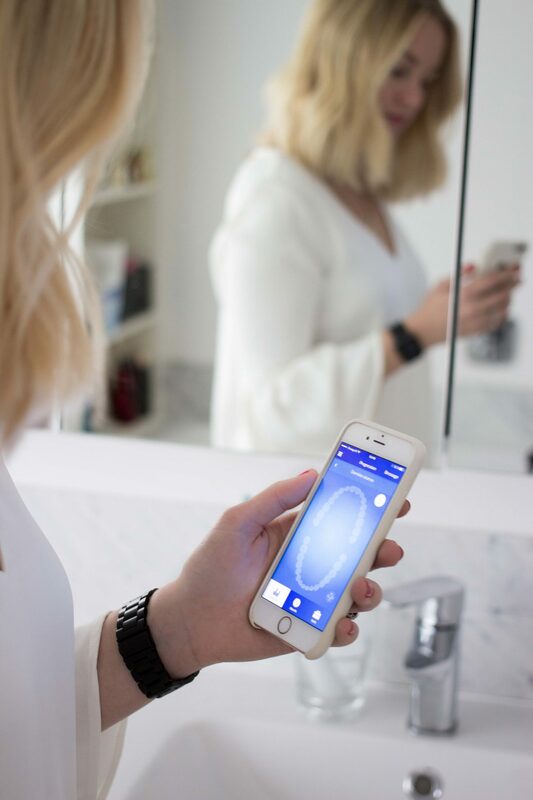 The app also keeps track of my brushing in real-time, which means that no zone are forgotten and that you’re more likely to brush for the recommended 2 minutes, twice a day. It also allows my dentist to mark certain areas that need specific attention so that I know exactly what I need to focus on. Another feature that makes this toothbrush my personal favorite is how customizable it is. Indeed, there are multiple brush heads for specific concerns (deep cleaning, gum health, whiter teeth and even tongue cleaning) but it also has multiple brushing options to help you maintain a healthy, beautiful smile. 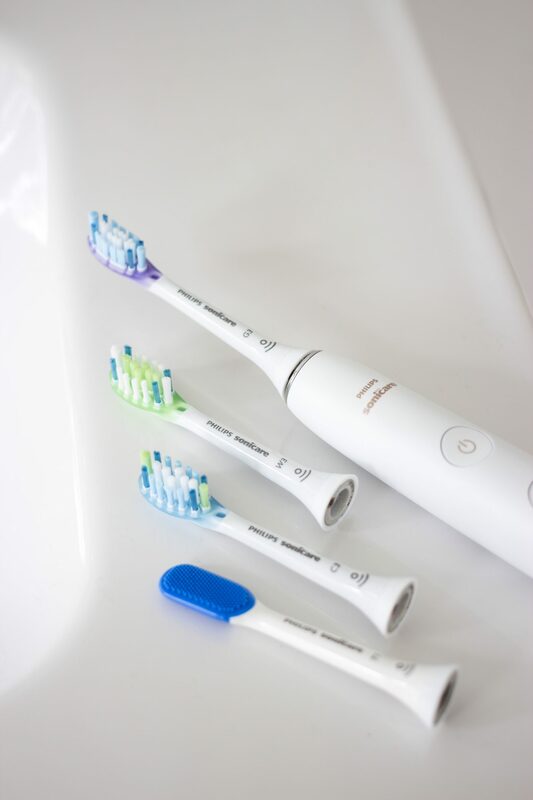 Each brush head is ‘smart’, which means that it will be recognized by the toothbrush that will automatically select the best mode and intensity setting for each brush head. I use the simple ‘clean’ mode on a daily basis but I also like to use the ‘deep clean+’ mode a couple of times a week for an even better experience. I also love the ‘gum health’ mode which is the best if, like me, you suffer from bleeding or receding gum. Finally, I also like to use the ‘tongue care’ mode a few times a week as this helps to keep a fresh breath all day long. 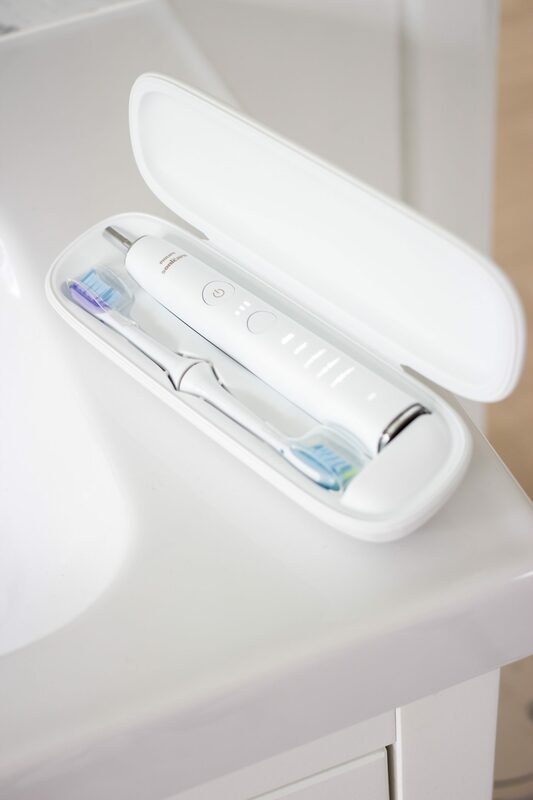 Furthermore, this toothbrush helps to fight plaque, especially in those hard to reach areas (it is proven that an electric toothbrush eliminates 10 times more plaque than a manual one). 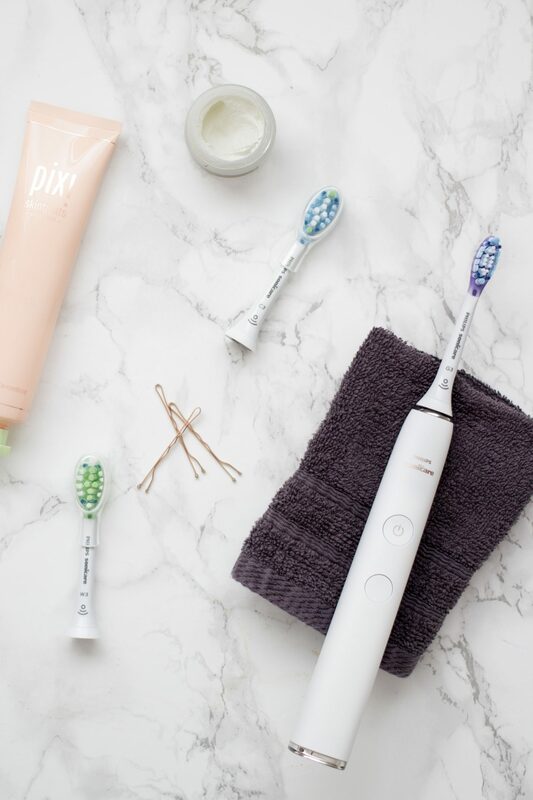 Thanks to the Sonicare technology, it vibrates back and forth which allows small water bubbles to really clean between the teeth to keeps them healthy, smooth and shiny. As someone with crazy sensitive teeth and gums, I am happy to report that although this toothbrush is really efficient, it is also gentle on your teeth and gums. To me, this is the perfect toothbrush to transition from manual brushing to electric! I haven’t had any problems whatsoever and I already see a major difference on my gums! While this brush is super efficient and really innovative, it also has a sleek design that I love. Toothbrushes are usually a bit of an eyesore in a bathroom but this is the first one that I am actually happy to have on my sink! What I especially love is its charger, a transparent glass that holds your toothbrush while charging it but that also doubles as a rinsing glass. Each brush head also comes with a transparent cap which makes them even easier to store in your bathroom drawer. If like me you’re often on the go and traveling around the world, then this will be your favorite feature. First of all, it comes with a stylish travel case that fits your toothbrush as well as two different brush heads. And while a fully charged battery will last you up to 2 weeks if you brush twice a day for 2 minutes, the real deal is hidden in the travel case. Indeed, it contains a USB cable that allows you to charge it by plugging it into your laptop… genius! While I won’t be traveling far away in the near future, I can’t wait to pack my bags and take it with me next time I am going away. 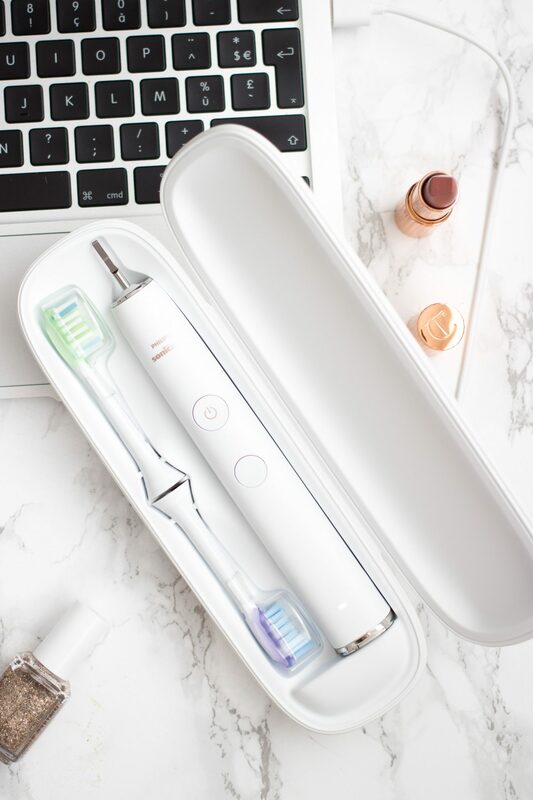 I always ditched traveling with an electric toothbrush as it seems a bit of a hassle but this makes it so simple and practical that I can’t imagine traveling without it! 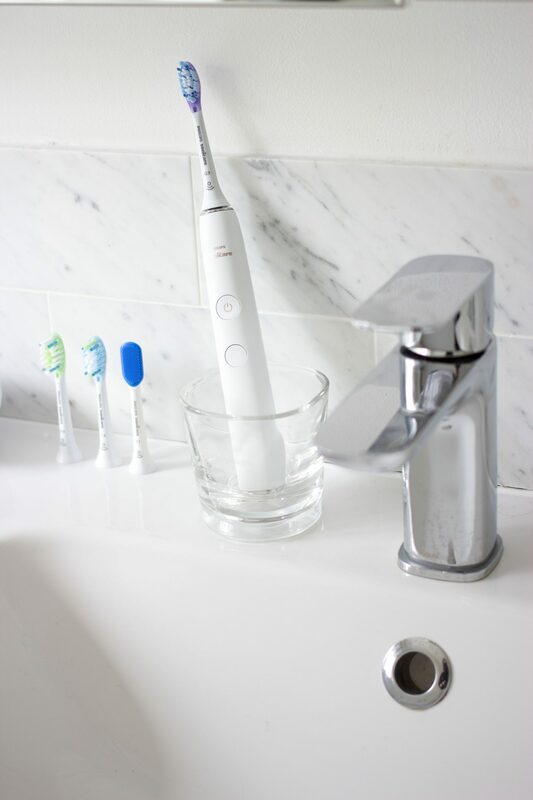 Curious to discover more about the Sonicare diamond clean smart toothbrush? Then make sure to head over to the Philips website! 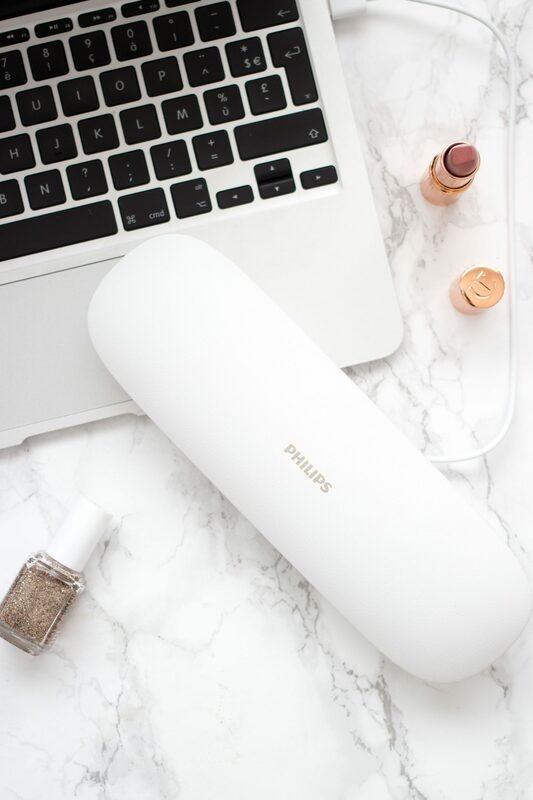 This post was created in collaboration with Philips.